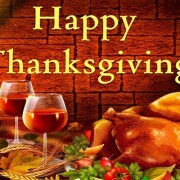 The Business Street Online offices will be closed today and tomorrow in observance of Thanksgiving. We hope you will spend this holiday surrounded by loved ones, and counting the blessings that have come upon you in the past year. May the joy and the spirit of this season be on you all! James Olinger is a native of the San Joaquin Valley. He graduated from West Hills College in Coalinga, California in 2000 with an associate's degree in liberal arts. He joined Business Street in 2004 as a staff writer, and became the associate editor in 2007. He maintains that position today, writing for Business Street Online in a variety of topics.